Ten-man RB Leipzig twice let a lead slip in an entertaining 2-2 draw at home to Borussia Mönchengladbach on Saturday. Leipzig's playing style is nothing new by now but that does not make it any less of a joy to watch. Ralph Hasenhüttl's men employed their familiar fast-paced, high-pressing game and put their visitors on the back foot right from the off. They took a deserved lead through a smart Timo Werner finish, only to be pegged back moments later when Thorgan Hazard converted from the penalty spot. However, Leipzig restored their lead before the break when Naby Keita's threaded pass found Jean-Kevin Augustin on the edge of the box, and the summer signing made no mistake. Leipzig appeared to be in control after the break and had a couple of chances to extend their lead before Gladbach captain Lars Stindl capitalised on a defensive mix-up to lash in a superb strike from distance. 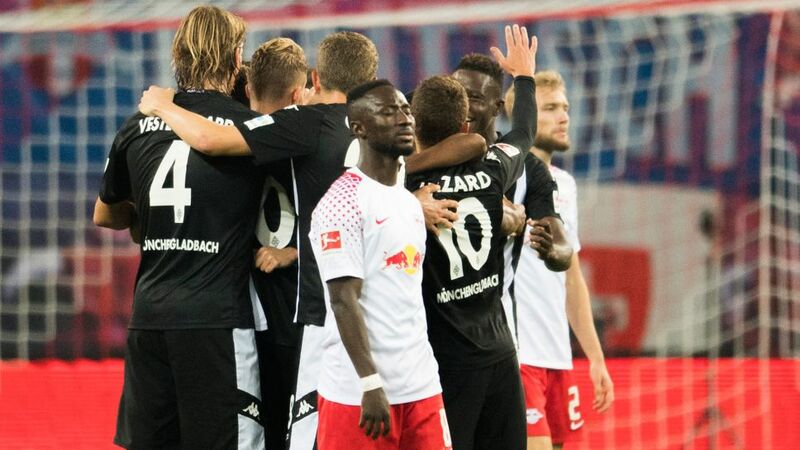 That equaliser gave the visitors more confidence to attack with greater purpose and Leipzig struggled to recapture their earlier dominance, especially after Keita was sent off late on. However, despite having an extra man the Foals were unable to press their advantage, leaving both sides to settle for a point. Werner was once again in irresistible form here, scoring an excellent goal and constantly tormenting the Gladbach defence with his astute movement and blistering pace. Augustin scored his maiden Bundesliga goal with his eighth shot in the league.Hazard made amends for missing a penalty in Gladbach's last game with Leipzig by scoring from the spot here. It also ended a run of three consecutive penalty misses by the Foals.Werner has scored at once in every Bundesliga game Leipzig have played against Gladbach (three).Leipzig scored before half-time for the first time this season.Leipzig have scored all six of their Bundesliga goals this season in the second half.Only Bayern Munich striker Robert Lewandowski (five) has more league goals than Werner this season (four).Emil Forsberg captained Leipzig for the first time ever in this match.Gladbach's Hecking was dismissed as Wolfsburg coach last season after defeat to Leipzig. Click here to visit the Leipzig vs. Gladbach Match Centre!